The Pakistani National Women Football Team is better than that. It’s not always that a women sport in Pakistan gets so much recognition, what with all the male sporting talent hogging the limelight with their wavy locks brushed around in shampoo commercials. If you think this statement is sexist, you haven’t heard it all. You may not know all of their names, but by know you may be able to identify a few. And that’s precisely what makes this bunch successful and loved. A blog recently objectified the national women football team complimenting their looks over their skills, and just like that these football heroines became immediately recognisable faces on the blogosphere. What their careers would’ve given them some time later (eventually), a simple blog write-up did it in an instance – Raheela Zarmeen, Shahlyla Baloch, Joyann Geraldine Thomas, Syedah Mahpara, Hajra Khan, Zulfia Nazir, Sahar Zaman, Abiha Haider and Diana Baig are few of the “new queens” on the block. As far as football goes, the summer of 2013 looked as dull as ever. Amdist the scorching heat of the Pakistani summer, the British Council organised a sporting event in Karachi under their new initiative called Developing and Organising Social Transformation Initiatives (or DOSTI). It came as a pleasant surprise to the organisers that the rather seemingly mundane matches between a bunch of women teams received greater hype than they’d anticipated. The losing captain, Zulfia Nazir, wasn’t bothered about defeat, she had her eyes set on a larger target. 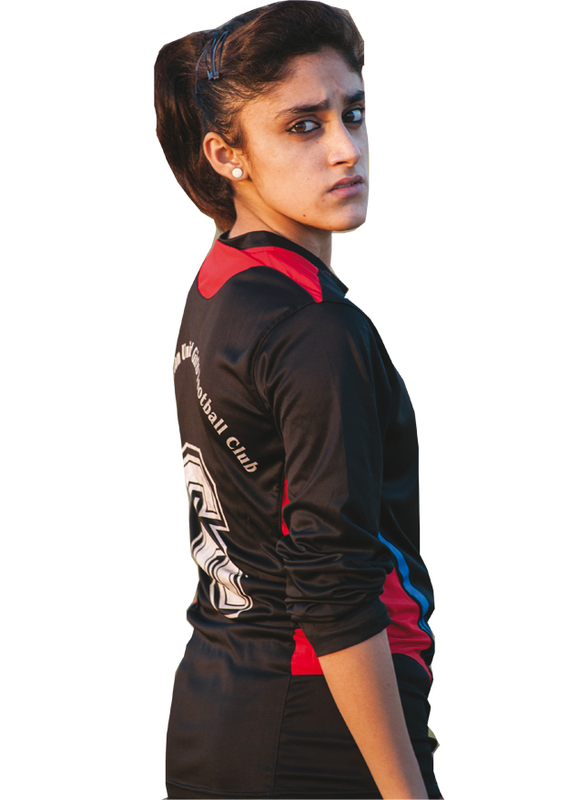 The left-midfielder also played with the Baluchistan United WFC – one of the premier women’s football clubs in Pakistan. 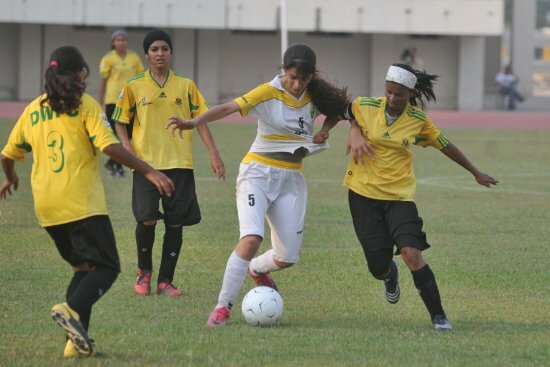 Zulfia Nazir was heavily featured in Myra Khan’s article about the prejudices female footballers faced in Pakistan. A stale cricketing season gave media pundits reasons to stretch their heads out of the box and look into other sports that were fast gaining acceptance – none even realising that women’s football clubs (FCs) were steadily, but aggressively, becoming dominant sporting arenas for young women to explore their talents. When a travel and culture reporter, Myra Khan, followed the exploits of 16-years old Zulfia at Baluchistan United, she saw an opportunity that she thought she could capitalise upon. Myra then began following the various women’s FCs through the 2013 Women’s National Championship and at the last day of the Sindh regionals, she finally had a story. Her story explored the many challenges female footballers faced while playing the game they love – the prejudices and all. This simple write-up stirred interest in a few niche circles but couldn’t completely deliver the results that were expected of it. The national championship were part of a sports exchange scholarship that saw the victors, the Young Rising Stars WFC, travel to the United States to serve as advocates for using sports as a powerful tool to empower young women. For here on, the media shied away into oblivion (yet again) with regard to women’s football in Pakitan. We have always argued that the sports development is players first and business later. The executives had been huddling together for ages to bring women’s football to Pakistan. Senator Rubina Irfan, the owner of Balochistan United and chairperson of the women’s wing of the Pakistan Football Federation (PFF) had taken the issue to a FIFA conference in Shanghai in 2004 where FIFA pledged 10 percent of its funds to be allocated to women’s football in Pakistan. 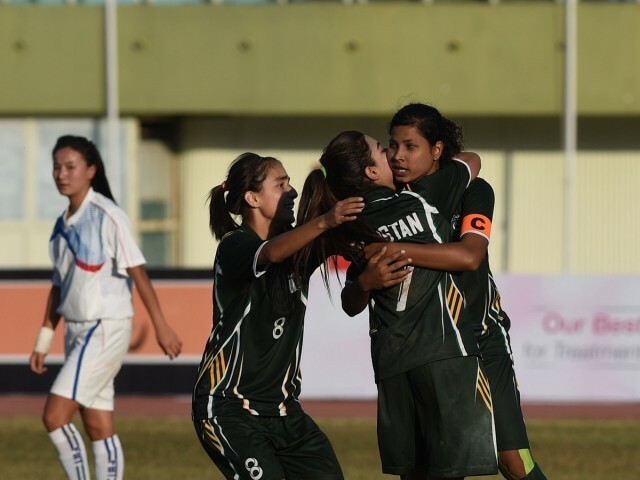 Pakistani women football players celebrate with captain Hajra Khan (R) a goal against the Bhutan team during their match in the 3rd South Asian Football Federation (SAFF) at the Jinnah Stadium in Islamabad. Those initial funds returned very good results – by 2013, Pakistan had 43 women’s FCs. Albeit, the executives merely shone their credentials where the credit was due and much of Pakistan didn’t even know of the burgeoning sporting talent. A year later, PFF announces the names of the National Women’s Football Team representing the nation at the the third South Asian women’s football championship organised by the South Asian Football Federation (SAFF). The news didn’t get much traction than the trivial “security concerns” update. This was the second time Pakistan was hosting these games, but something was different this time around. Pakistan has already hosted the South Asian championship in 2005 under General Pervez Musharraf’s rule. Back then the players had to follow a strict dress code – they were required to wear trousers instead of shorts normally worn by players. The year 2014 saw a complete change in attitudes; the players were rather asked to wear shorts instead. In an overly conservative Pakistan culture, this quickly became “talk of the town”, bleeding its way onto the blogosphere. Good or bad, the articles being written about Pakistani female footballers had more to do with objectifying them rather than acknowledging them for their game and skills. Let alone the fact that this was the first time in a long time that Pakistan truly saw international sporting action on its turf. By now, the Young Rising Stars WFC team had come back from their trip to the United States and started exploiting the social media to get the desired audience excited about their games. They surely had been mentored to a greater professional understanding of the business of football. They realised that people wanted to know players rather than the going-ons on the executive front. They’d periodically release snippets of video (see below) and a handful of photos to keep their fans interested – and their following grew. The club saw that by relaxing the strict dress code of only wearing trousers and not giving into the prejudicial societal norms, the zeal of the players grew greater. As more players came through the gates, the club saw massive success in months to follow. But how could the ultra-conservative blog-heads not capitalise on the opportunity to besmirch the names of these rising footballers. They took to the web and started using terms like “hot” and “gorgeous” to describe these young women. You’d think it was bad for the sport, but it was quite the opposite – as they say, no publicity is bad publicity. On 30 March 2015, Al Jazeera published English published an article about Joyann Geraldine Thomas, a young Pakistani Christian girl who was named as a defender on National Women’s Football Team. Even though her debut international game “barely received the attention associated with an international fixture”, the news company had come to know of this young player through the blogosphere. Amidst the crazies objectifying female footballers on the web, Al Jazeera went ahead with the “softer, truer story beyond the game”. Joyann Geraldine Thomas is backed by her mother, a former track and field athlete. With this positive news, many multinational organisation saw an opportunity to herald their brands through the fresh faces emerging through the sport. It is rumoured that few of them are scouting for brand ambassadors within the national team, although reports have been mum about who their choices are. 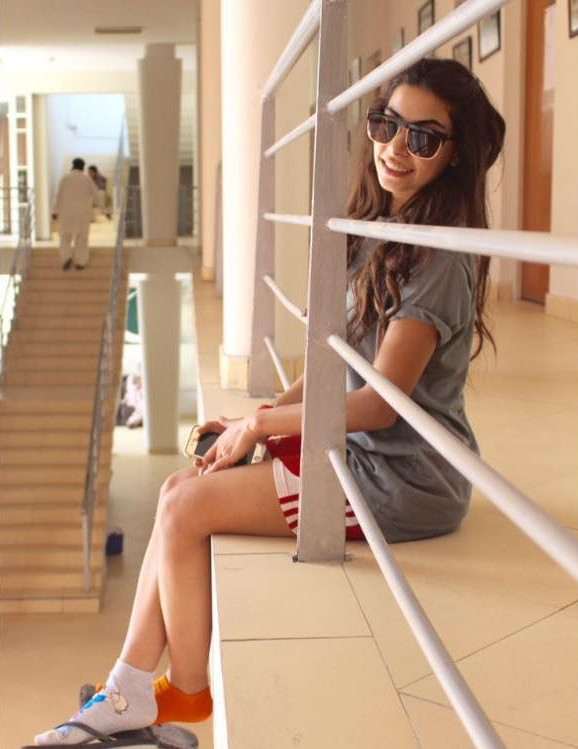 Shahlyla Ahmadzai Baloch became one of the first Pakistani female football to be signed by an international club. No matter the publicity the team received, the outcomes have largely been positive. Days before the Al Jazeera article, Baluchistan United WFC announced it would collaborate with Maldives’ Sun Resorts and Hotel Football Team on a player exchange programme. National team capitan Hajra Khan and key striker Shahlyla Baloch both became the first female footballers to sign a contract with the foreign club, while the Maldives striker Areesha Riza came to Pakistan to compete at the National Women Championship with the Baloch club. These young footballers are the pride of the nation and not just a “pretty face”. Had it not been for their efforts, sports development (at least with regard to football) would be a national dream. We salute these brave and strong girls and wish them the best in their lives and careers. Also, it’s time that you start noticing them as well – know the squad, know their names, know they’re here to stay. Previous What are Forms 14 and 15?